Are you interested in making more money? The example below is based on a $5,000 commission payout. It shows how much more an agent would make by joining our virtual cloud based real estate brokerage. In this example, we are using the 100% flat fee for California of $495 per transaction. Your state may be lower, so be sure to check here. 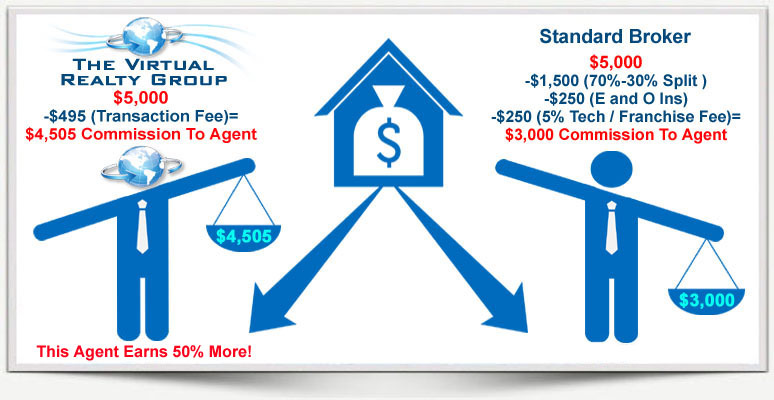 The typical standard broker fees are shown in detail, compared to the fees we would charge. Wouldn’t you want to earn 50% or more, than what you earn now? Take your career to the next level. Give yourself a raise! Click the image below to contact us.